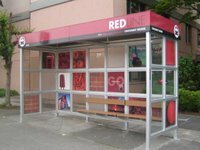 Whatcom Transit Authority now offers "GO Lines," servicing WTA's four highest-ridership routes every 15 minutes. The GO Line bus routes and buses are identified by color: blue, green, gold and red. This makes me wonder: How will color blind people be able to know which bus to catch? I believe WTA forgot to study a certain demographic before launching this campaign.